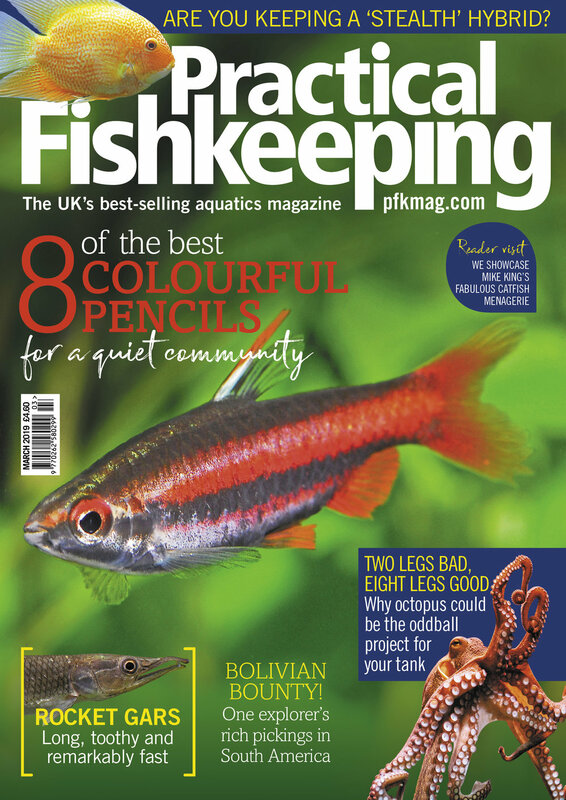 The March 2019 issue of Practical Fishkeeping is positively bulging with all of your aquarium favourites! Next up, we have the discovery of an underground Swamp eel. Find out how an amphibian expert in India discovered a species that’s making us rethink what a ‘fish’ really is. This month’s habitat exploration comes courtesy of Daniel Konn-Vetterlein who takes a trip deep into Bolivia in a hunt for catfish and characins. Is your next biotope aquarium idea right here? Our reader visit takes us out to the home of Corydoras keeper Mike King who shows us around his treasure trove of a collection and drops some handy tips on home spawning. Neale Monks investigates a fish that’s as long as it is toothy – the Rocket gars of the genus Ctenolucius. Find out if your set up is right for one of these high-speed predators. Is your tank home to a ‘hidden’ hybrid? Jeremy Gay looks at the stealthy hybrids that most keepers don’t even know are a mix of multiple species. You’d think that setting up a biotope in South America would be easy, right? Not so, says Tai Strietman who is living in Brazil. Follow his story of setting up an authentic Characin aquarium. Sometimes eight legs are better than two, and never is this more true than in the world of the fascinating Octopus. Tristan Lougher looks at the cephalopods that you can try at home – but only if you’re an experienced aquarist. We have a trio of ‘Fishkeeping know-how’ features, including everything you wanted to know about all the different aquarium wood types available, how to deal with phosphates in your tank, and how to put together a staple supply of treatments for your medicine cupboard. Also in this issue we have all our regular features, including an ethical debate about venomous fish, a roadtrip to Lincolnshire, the latest fishkeeping news, 9 pages of your questions answered, product reviews of Oase’s thermofilter, Eheim’s new food (and more), as well as letters and the editor’s tailpiece op-ed.